Charles Norman Shay is a tribal elder in the Penobscot Indian Nation and a combat veteran of several wars. Born on 27 June 1924 in Bristol, Connecticut, he is the eighth of nine children of Leo Shay and Florence Nicolar, daughter of Joseph Nicolar, author of the 1893 classic book Life and Traditions of the Red Man. As a five-year old boy, he joined his parents moving back to their tribal reservation village on Indian Island in Maine. Many generations of his ancestors, including Lieutenant-Governor John Neptune (a famous shaman-chief in the early 1800s) and Chief Joseph Orono (who had led his warriors in support of the American Revolution), had lived and died on this island. Attending school in Old Town on the mainland, as the only Indian boy in a class of 40 students, he crossed the river by ferry or canoe, or walked across the ice in the winter. In April 1943, almost a year after graduation from Old Town High School, Charles was drafted into the US Army and trained as combat medic. He joined the 1st Infantry Division, 16th Regiment, 2nd battalion, then garrisoned in southern England. Also known as the Big Red One, this Division had successfully campaigned against German enemy forces in North Africa and Sicily. Experienced in amphibious landings, it was now preparing for the invasion of Normandy. As a combat medic, Private Shay was assigned to an assault battalion in the first wave of attack on 6 June 1944. For his valor on the battlefield, having rescued drowning wounded comrades under enemy fire, he received the Silver Star. D-day, June 6th, 1944, Shay lands in Normandy. In 2007 he returned and was honored. After frontline duty in the battles of Aachen, Huertgen Forest, Ardennes (Battle of the Bulge) and the Rhine (near Remagen), he was captured in the Sieg Valley. Spending nearly a month in German prison camps, Shay was liberated on 18 April. In Fall 1945, after World War II had ended, he was awarded four bronze battle stars and demobilized. Facing unemployment on the Penobscot reservation, Shay reenlisted as a medic the following spring and joined the Military Police Company headquartered in Vienna in late 1946. After four years in Austria, where he met his wife Lilli, he returned to the US. In 1950, he was assigned to the Medical Company of the 3rd Infantry Division’s 7th Regiment, which was sent to Japan when the Korean War broke out. In November 1950, he landed in North Korea where his Division fought against the invading Chinese army. Promoted to Master Sergeant, Shay received the Bronze Star with two Oak Leaf Clusters for Valor and was nominated for a second Silver Star. Charles Norman Shay has been retuning to the beach in Normandy, where he landed on D-day as a young medic, since 2007. Every year he performs an Indian blessing for his fellow soldiers. Six months after his honorable discharge from the US Army, Shay joined the US Air Force Reserve in February 1952 and a year later became an active-duty Master Sergeant. After several months, he was transferred to the Tinker Air Force Base (Oklahoma) as a medic for the 6th Weather Squadron. As a member of that mobile squadron, he traveled to the Marshall Islands in the southern Pacific Ocean and participated in a series of atomic bomb tests (“Operation Castle”) at Eniwetok Proving Grounds in 1954. In 1957, having been reassigned several times, Shay returned to Germany, joining the US Air Force Hospital in Wiesbaden. There his son Jonny was born. Shay’s last active duty military position was at the US Air Force hospital at Sembach, the Cold War airbase for the Tactical Missile Wing in Germany. In the summer of 1964, after more than twenty years in the US military, Master Sergeant Shay retired and moved to his wife’s home city in Vienna. A year later, he obtained a position with the International Atomic Energy Agency (IAEA), headquartered in Vienna. At age 60, after 20 years with the IAEA, Shay retired from that United Nations (UN) agency. He then spent three years as a security officer at the Vienna-based office headquarters of the UN High Commissioner for Refugees, leaving that post in November 1988. That year, while vacationing in the Penobscot Indian village, he inherited the house and tipi of his mother’s sister Lucy Nicolar and her Kiowa husband Bruce Poolaw. In the years that followed, he and his wife summered on Indian Island, gradually restoring the old family property. In 2003, having sold their home in Austria, Shay and his wife settled permanently on the reservation, where she died soon thereafter. 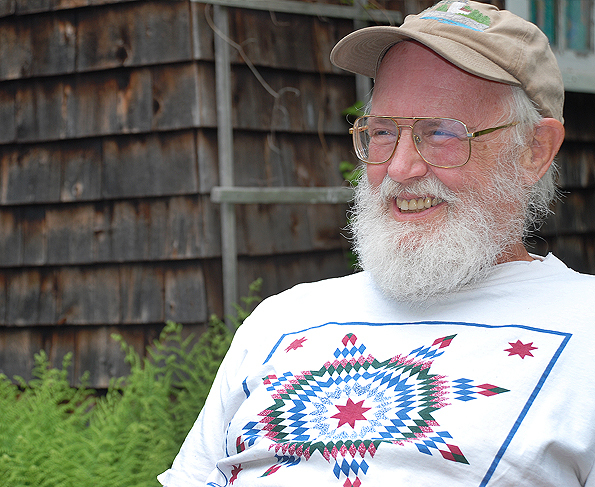 Since then, he has dedicated himself to preserving and promoting Penobscot cultural heritage. In addition to running a small museum in his tipi, he has also published booklets by and about Penobscots, and facilitated in the publication of a new edition of his grandfather’s book, Life and Traditions of the Red Man (Duke University Press, with a Preface by Shay). Charles Shay returns every year to Normandy, to give tribute to his fellow soldiers. On 6 June 2007, Maine State Governor John Baldacci paid public tribute to Shay, issuing in his honor a proclamation declaring that day “Native American Veterans History Day.” He also received an official Sentiment from the Maine State Legislature, recognizing his heroic military service. Over the last decade, Shay has given many talks in France and in the U.S. about his military service and Indian heritage. On one of his trips he met In Normandy, Madame Marie Legrand of Caen in Normandy. Shortly thereafter, Caen launched an effort to establish a memorial park honoring all North American Indians who landed on the shores of Normandy on D-Day. On June 5, 2017, Shay was honored at a ceremony dedicating the Charles Shay Indian Memorial in Saint Laurent-sur-Mer Park, on the bluff overlooking Omaha Beach. Shay was only 19 years old when he struggled ashore Omaha Beach, as a platoon medic serving in Fox Company, 2nd Battalion, 16th Infantry Regiment. The 16th Infantry Regiment was one of three combat regiments in the 1st Infantry Division that spearheaded the assault on D-Day. French and American dignitaries attended the event, including Penobscot Indian Nation’s chief Kirk Francis. Penobscot language instructor Mr. Gabe Paul sang the traditional Penobscot Honor Song, and Maine singer-songwriter Lisa Redfern sang her ballad written about Shay. In 2007, retired Master Sgt. Shay made his first pilgrimage to Omaha Beach, and several other major World War II battlefields. During that trip, for the first time, Shay spoke about his heartrending wartime experiences, including being a comfort to many who didn’t survive and saving wounded soldiers on the beach that ran red with blood. That same year, this Silver Star veteran received the Légion d’Honneur directly from President Nicolas Sarkozy at the French Ambassador’s residence in Washington, DC., for his heroic duty to France. The ceremony dedicating a Memorial Park named after Charles. His nephew, Tim Shay sculpted the turtle, which is the Indian spirit animal of Charles. Charles also wrote an autobiography, Project Omaha Beach – The Life and Military Service of a Penobscot Indian Elder, published by Polar Bear & Company. Shay – almost 93 – continues to make annual trips to France for commemorative events related to D-Day, and to re-establish Penobscot-French relations that reach back to France’s alliance with Maine Indians in the colonial period. Shay has is a direct descendent of the French military officer and aristocrat Baron de St. Castin (for whom the small seaport of Castine, Maine, is named) and his Penobscot Indian wife, Pidianiske (daughter of the famous Grand Chief Madockawando). Special thanks to the Penobscot Indian website history for information contained in this piece along with Bunny McBride and Harald Prins.